Wouldn’t it be so neat if I decided to pay homage to our blog by decorating my mantel for fall with a “Picket Fence” theme? I would be feeling so sentimental about our “little blog that could” that I would run all around town trying to find an old section of a picket fence to put on my mantel. And when I couldn’t find one, I would decide to build one out of sheer determination to celebrate my love for At the Picket Fence. I would purchase all of the pickets and the back boards and set up shop in my garage where I would put together my own little picket fence and be so proud of myself and be thinking in the back of my mind that if this whole blog thing doesn’t work out I could always start a new career as a picket fence builder! Can’t you just imagine me gently placing that picket fence on my mantel and adding a large over-sized grapevine wreath and then a smaller one inside of it? And then I would search high and low for real pumpkins and then when I finally found them I would place a trio right in front of the picket fence. Wouldn’t it be such a special moment when I got it all done and I stood back to look at my Picket Fence Fall Mantel and marveled at my cleverness for decorating based on the name of our blog? And I would write a blog post all about how this fall mantel was created with a ‘pun intended’. That would be pretty amazing, huh? But, is that what happened? 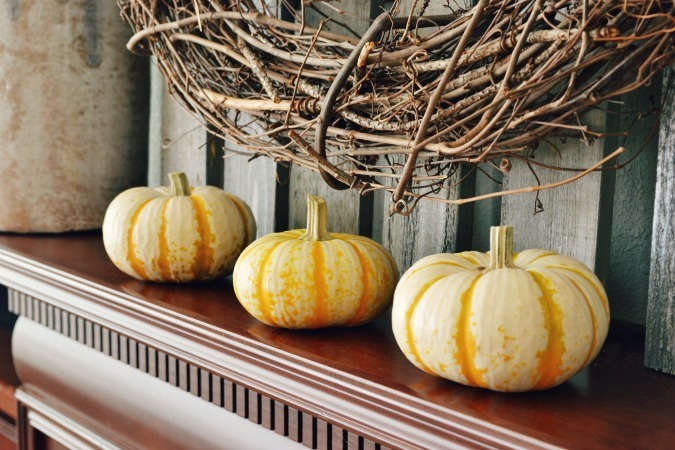 Oh sure, I searched high and low for a picket fence before finally building one myself and setting up my Picket Fence Fall Mantel and found just the right trio of pumpkins to place in front of it. And yes I stood back and admired how it turned out and patted myself on the back for making my own picket fence. But never ONCE did it occur to me that my Picket Fence Fall Mantel had anything at all to do with our At the Picket Fence blog. Not when I had it all decorated. Not when I walked past it every day for two weeks. Our blog is called At the Picket Fence and I made a Picket Fence for my mantel. Yep. That was totally intentional! Be sure to come back tomorrow when I show you how you can make your own Picket Fence Wall Art! 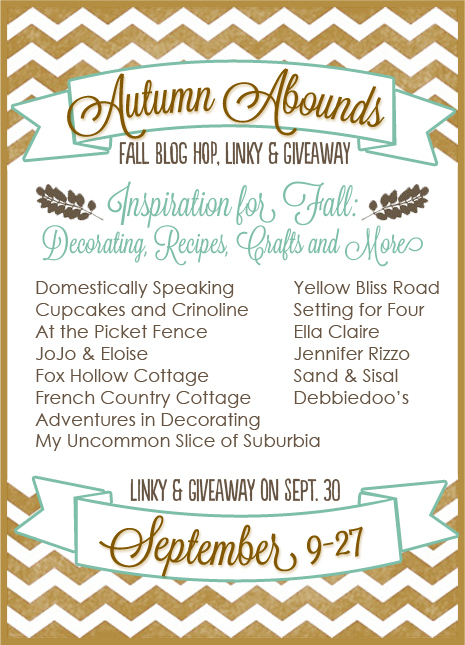 I’m so excited that this post is part of the awesome Autumn Abounds Fall Blog Hop, Linky Party and Giveaway. 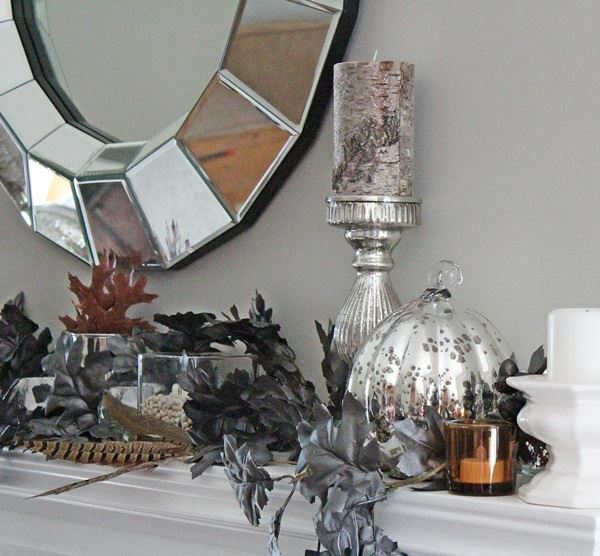 Here’s a sneak peek of what’s coming up tomorrow when Heather from Setting for Four shares her Glam Fall Mantel. Jennifer from the Jennifer Rizzo Design Company shared How to Paint a Pumpkin Art Canvas. 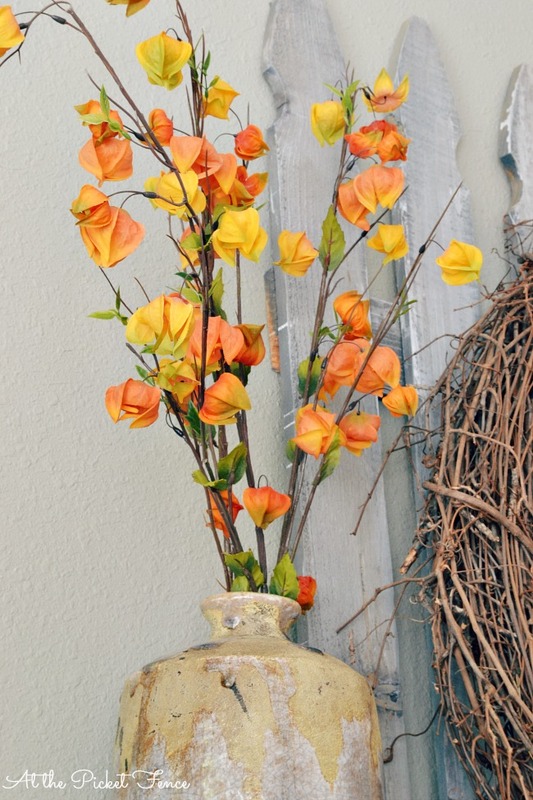 Kristin from My Uncommon Slice of Suburbia shared her Rustic Fall Mantel. Maryann from Domestically Speaking shared her Autumn Apple Poppers. 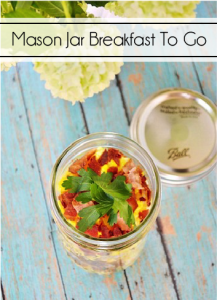 Kristin from Yellow Bliss Road shared a Welcome Autumn Breakfast. 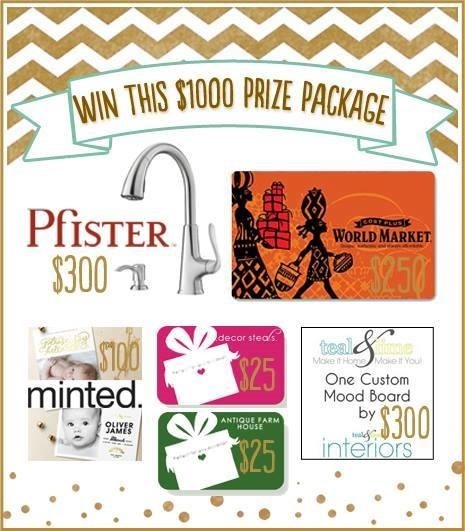 AND on September 30th it’s YOUR turn to share your Autumn inspiration with us and enter for a chance to win this $1,000 Prize Package! Woo hoo! Thanks so much for joining me and my totally intentional Picket Fence Fall Mantel! 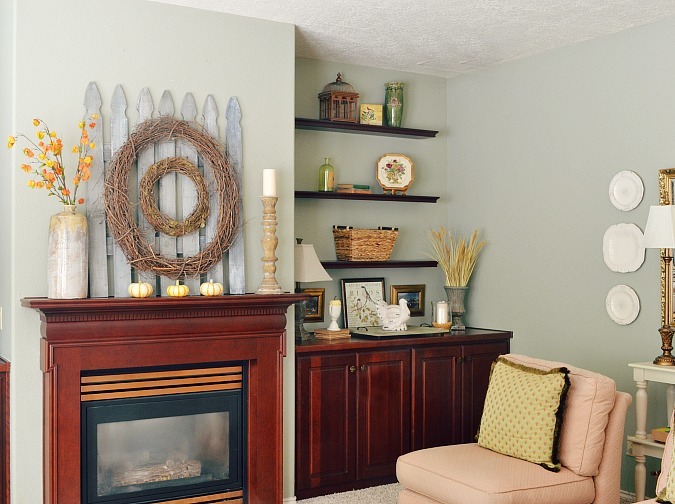 42 Comments on "My Picket Fence Fall Mantel…literally!" You crack me up, Vanessa! I love your post AND your picket fence Fall mantel that, appropriately, became dedicated to your blog name, even though it wasn’t?!?! LOL 🙂 The layering is beautiful … genius mounting two wreaths to your very impressive handcrafted picket fence! The splashes of orange are fabulous, and I’m jealous you found the perfect pumpkins! Happy Fall, sweet friend! I love it! 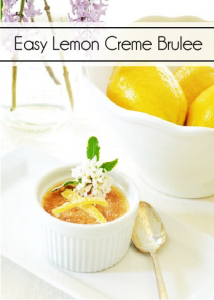 It’s simple, gorgeous….it’s perfect! 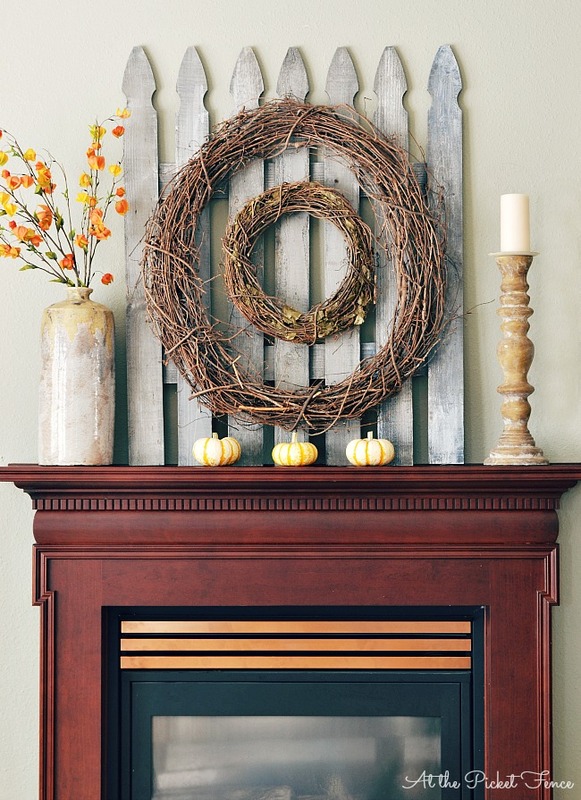 LOVE your Fall mantel decor. This is brilliant – simple but so eye-catching! I really like what you did. It is really simplistic but make a statement. I love your mantel Vanessa! Complete serendipity!! Your room looks so cozy! Pinned! Thanks so much Heather! Definitely serendipitous! But, yes you are ever so clever! 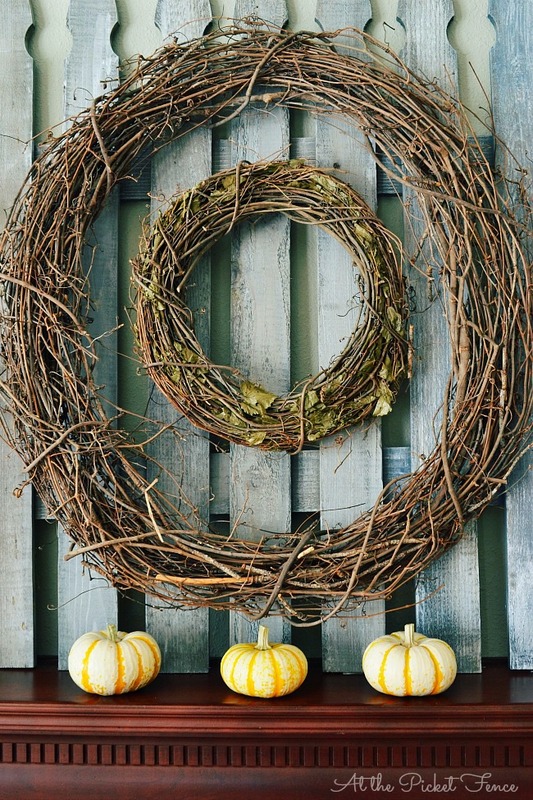 So clever, I love the wreath within a wreath! Super cute post and I do love your mantle. =) I just pull out some of my fall decorating, so I have a lot to do to catch-up with the blog-world! Vanessa. this was such a cute post! I can’t believe that you did not make the connection from the very beginning! Your mantel is lovely. The picket fence is so appropriate! Very cute! Looks so cute Vanessa!! Pinning!! I love how you used a picket fence as a backdrop for your mantel display. The combination of so many different textures are perfect for Fall. What a cute story to go along with your picket fence! I had a good giggle this morning. 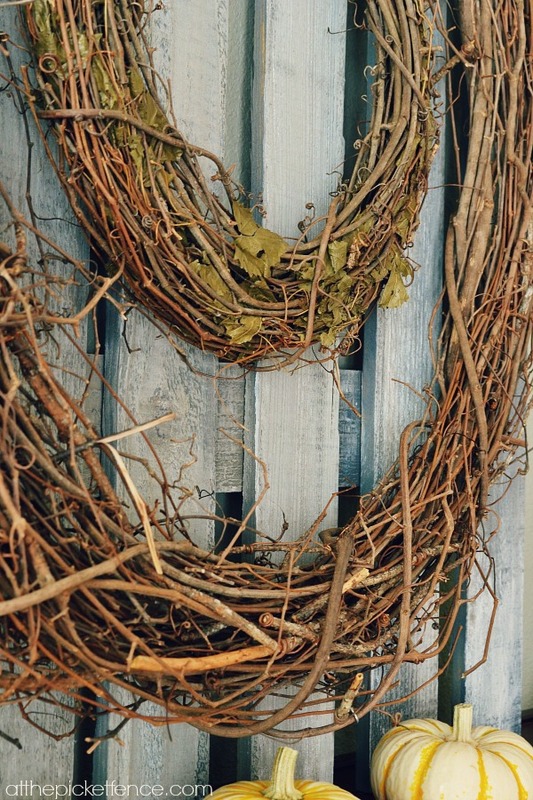 The wreaths on the picket fence are so creative… well, everything is so creative! Haha!!! You are too funny! I adore your mantel and have shared and pinned your picket fence awesomeness! Maybe I should make one with paint cans and brushes and drop cloths to go with my blog name! Oh!! I LOVE this. It is so Absolutely Cozy and Perfect! I love how your Sweet Momma pointed out the Relation between your Mantel and your Lovely Blog. Very Sweet! Such a pretty mantel and a great story to boot! I love the uncluttered look ~ just enough. p.s. Most of my life has been spent having aha moments….I sort of live in a state of oblivion! 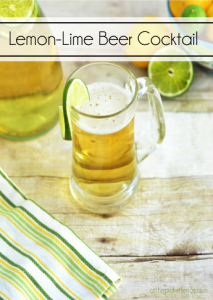 Have a great week ~ pinning and sharing of course! So perfectly rustic and beautiful! I LOVE IT!! Thank you so much Kristen! I don’t normally do a lot of rustic but this one was fun! Autumn Abounds recap and a huge giveaway…! Love the Picket Fence! (and At The Picket Fence, hehe) Your mantel looks great. Love the simplicity.